Early pace-setters Westbury posted their third straight victory of the Cherwell Cricket League campaign. Westbury saw off Oxford II by 57 runs in division two. Tight bowling tied Westbury down early on before Olly Tice fell two runs short of a century and Tom Wilson struck 54 as Westbury set 275-5 in their 50 overs, Mursaleen Sadiqi taking 3-60 and Andrew Busby 2-28. Mursaleen Sadiqiq then scored 51 and Abdullah Sadiqi 30 in Oxford’s quick start in reply but tight bowling from veteran Richard Tredwell 3-33 and Graham Judd 3-40 restricted them to 218-9 at the close. Ed Somerton’s brilliant unbeaten century saw Cropredy to a six wicket win against visitors Leighton Buzzard Town. Earlier, Mike Amos-Simpson claimed 4-32 in Buzzard’s 250 all out. But Somerton then scored an unbeaten 105 as Cropredy cruised to 251-4 with six overs to spare. Sandford St Martin were involved in a tie with visitors Bledlow Village, both teams finishing on 276 in a match which went down to the final ball. Mark Robey took 6-33 as Bledlow posted 276-9 in their 50 overs, Matt Bolton top scoring with 78 and Mike Winson 75 not far behind. Sandford’s Mark Robey 97 and Kris Jones 66 shone in their side’s reply. 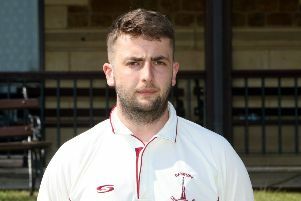 But, with Ben Moore taking 5-45, the west Oxfordshire side were bowled out off the final ball of the match as it ended in the most thrilling of circumstances. Brackley beat Tiddington II by 80 runs in division four. Adam Wirth hit 68 and Josh Rowland 48no in Brackley’s 205 all out, Max Smith taking 4-52. Tiddington never got close as Josh Markham took 4-21 in their 125 all out. Cropredy II went top of division five as they defeated hosts Leighton Buzzard Town II by 51 runs in a high-scoring clash. Buzzard won the toss and invited Cropredy to bat. They set about the hosts’ attack to rack up 316-6, Tom Coggins hitting 68no, Ben Ward 67no and George Buckingham 56. Chris Plumbe then took 3-52 as Buzzard were all out for 267 in the 47th over. Minster Lovell II maintained their 100 per cent start to go top of division six with a 31 run victory at Banbury IV. Jacob Mayers top scored with 74 in Minster’s 223-7 before Banbury were bowled out for 192, despite 75 from Luke Wetherill. Colin Simpson’s century helped Sandford St Martin II to a five run win at Horley II. Horley set 265-7 with Mark Tubb hitting 78no. Simpson then hit 100 and Greg Pearson 99 to steer Sandford to 270-8 despite Julian Wright taking 5-61. Altaf Hussain returned superb figures of 5-6 to help Cropredy III to a seven wicket win against visitors Eynsham II in division ten. Eynsham were skittled out for a paltry 90 thanks to Hussain’s haul and then Cropredy eased home at 91-3.